Unison Research Unico CD Uno Cd Player with USB DAC. Available with Online Finance and Free Delivery. 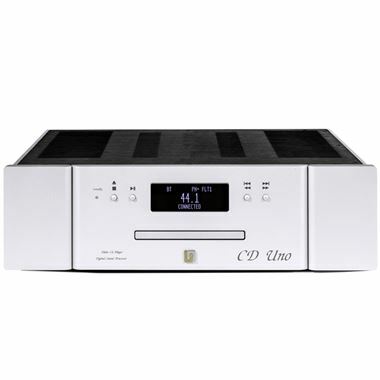 The Unico CD Uno is a high-specification DAC with integrated CD mechanism that is flexible and customizable. The CDUno combines Unison Research’s high-end sound quality with the broad playback possibilities offered by today’s digital audio solutions. The CDUno will allow you to play back all the music formats and sampling rates currently available on the market. The Unico CD Uno boasts a wide variety of inputs and outputs. On the back-panel there are inputs for USB and Toslink TM cables, and built inside the housing is a BluetoothTM receiver that allows for wireless streaming from compatible devices. The audio stage uses one 12AU7//ECC82 double triode, operating in pure class A, followed by a solid state discrete buffer still operating in class A for a low impedance output and ideal audio behavior. Aesthetically the CDUno, like the CDDue, differs from existing Unico products with its new three- fold faceplate, white LEDs and white display. This same aesthetic will pass over to the new Unico 90 and Unico 150 amplifiers, which are designed to be perfect matches for the CDUno and CDDue.